Reflecting the cutting-edge nature of the work being carried out by RACE (Remote Applications in Challenging Environments), TORMAX was contracted to design and install a prestigious 3-wing revolving entrance combined with automatic pass door, delivering easy access for staff and visitors to the research facility near Oxford. Representing one of the most advanced operators on the market, the swing door is powered by an TORMAX iMotion 1301 door drive, uniquely designed to deliver unparalleled reliability and longevity. 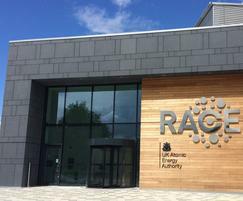 As part of the UK’s Robotics and Autonomous Systems (RAS) community, RACE is at the heart of ensuring ideas and solutions are shared across sectors. 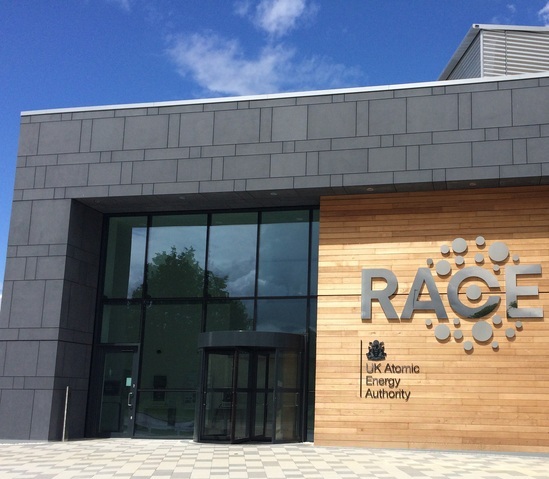 RACE is part of UKAEA’s growing technology programme at their Culham Science Centre site , near Abingdon, where world-class publically-funded research into fusion power combines with commercial technology organisations and the Culham Innovation Centre, to create a powerhouse of high technological advancement and enterprise. Working with Queninborough Aluminium Services (QAS), TORMAX has created an eye-catching yet functional entrance system that is in keeping with the impressive, contemporary design of the building. 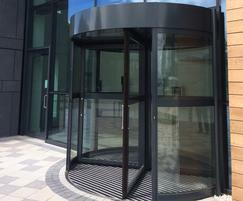 Demonstrating a commitment to sustainability, a manual revolving entrance was specified, effectively helping maintain the ambient temperature of the main reception by reducing heat-loss from the building. Offering clear access for the less-able, as well as to allow for bulky deliveries, an automatic swing door to one side provides smooth, hands-free passage. Designed at the TORMAX HQ in Switzerland, the iMotion 1301 door drive incorporates a high torque synchronous motor that that features none of the parts that usually wear out, such as gears and brushes. This ensures both a long life span, as well as low maintenance requirements.